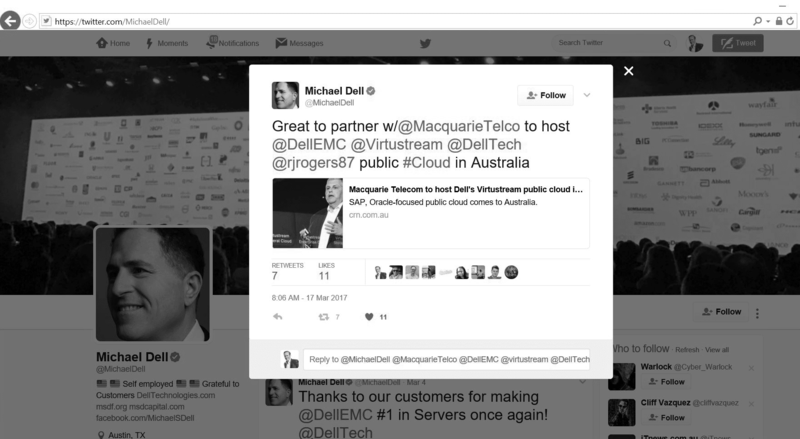 Macquarie announced last week that we had secured Dell Technologies (and its subsidiary Virtustream) as a significant new customer. We are thrilled to be supporting their sizeable investments in Australia and in their Australian customers. For those that follow Dell Technologies, their complete focus on driving digital transformation with its customers – IT, workforce and Security – is clear. And that requires both their legacy businesses and increasingly their new, cloud orientated service offerings to realise this plan. This is where Macquarie comes into the picture, providing the local infrastructure for the Dell cloud to be delivered in country, across multiple availablility zones. And of particular note, is that one of these availability zones sits within our Intellicentre 4 Bunker – our purpose build secure in our Canberra data centre. This fact alone will position Dell well as they can connect direct to government agencies via ICON (AU Government’s own fibre network), and leverage our sizeable work providing cyber security services to the Commonwealth (42% of AU Government are our customers). No need to long line back to public clouds based in Sydney and the associated security issues usually associated public cloud adoption. There is some real magic here. We have seen this in our own Macquarie Cloud, that has Sydney and Canberra availability zones and certified by the Australian Signals Directorate (ASD) for use by the Australian Government. I took the time out from my focus in Canberra to travel to Washington DC to visit the team that built the VS platform & business. I wanted to personally understand the extent of what it enabled and why Dell saw so much value in the platform. There are some seriously experienced IT enterprise professionals behind the business. If anyone is going to make it work for Dell Technologies, it’s this team. The rewards are significant and Dell Technologies are investing big dollars to realise these rewards.